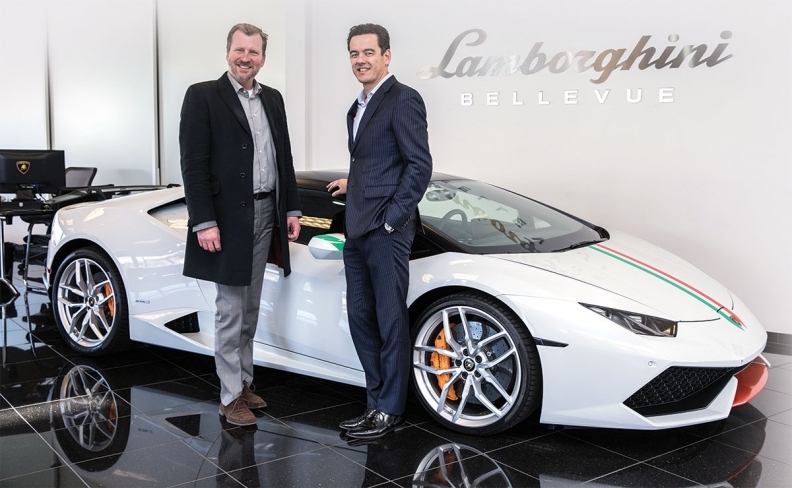 General Manager Mark Maakestad, left, and Christian Chia, president and CEO, OpenRoad Auto Group, at Lamborghini Bellevue in Seattle, Wash.
British Columbia's largest automotive dealership group has assumed ownership of the only so-called supercar dealership in neighbouring Washington state. Bentley, Lamborghini and Rolls-Royce Bellevue is the OpenRoad Auto Group’s first foray south of the border. Addition of the established luxury dealership adds two new nameplates to the OpenRoad lineup, Lamborghini and Bentley, and gives it a second Rolls-Royce outlet bringing the group count to 17 nameplates. Before the Seattle purchase, premium and ultra-premium brands included Audi, BMW, Jaguar, Land Rover, Infiniti, Lexus, Porsche and Rolls-Royce (Vancouver). Washington provides a newer market for supercar business that only recently has begun to develop there. Dimitri Kotsalis, OpenRoad area general manager, declined to disclose a sales figure, but said the company saw Washington’s aging population with increasing disposable income as a market it couldn’t ignore. While the B.C. supercar market has slowed somewhat, it still grew at five times the rate of all new-car sales in 2016. That growth “hasn’t eaten into sales from lower-end brands because supercars are usually bought in addition to, not instead of, other vehicles,” said Kotsalis.